Our 18 Passenger Trolley Bus featured below will ensure your next special occasion is extraordinary. There’s plenty of room inside our trolleys and your chauffeur will ensure you arrive safely at your destination. Isn’t it time you were treated like a VIP? 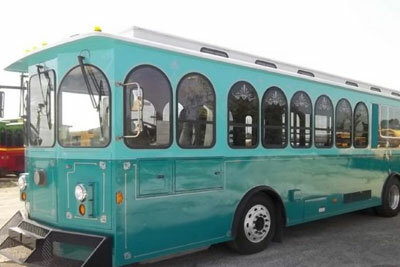 We’re the premiere trolley rental service in Chicago. See why for yourself! Get ready to experience a fantastic adventure in Chicago aboard this beautiful, 18 Passenger Trolley Bus. It’s simply awe-inspiring when you step inside. the state of the art surround sound, and everything in between, you’re sure to enjoy this ride! The fiber optic ceiling and strobe lights leave no doubt as to the party inside! 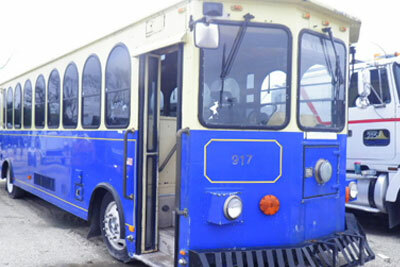 No matter what the event, such as a bachelor or bachelorette party, a prom, or just a night out on the town in Chicago, this 18 Passenger Trolley Bus is waiting. Let our professional chauffeurs get your safely from one destination to the next and in complete style and luxury. Give us a call today at 312-771-7273 for a complimentary quote. Isn’t it time you were the VIP?